Gaining insights into your heart health and taking action! Which screening is right for me? Are you a Vulnerable Patient? Each year close to 1.4 million people in the United States experience a heart attack, and in excess of 500,000 die from it. Amazingly, 50 to 70% of those individuals who died from a heart attack were not aware of their risk. If you are at risk of a near term future heart attack, we refer to you as a vulnerable patient. Learn more about decreasing your risk. Cypress Diagnostic Imaging is a specialized Cardiac and Vascular Center, offering an array of diagnostic studies as well as Early Detection Cardiovascular Disease screenings. Cypress Diagnostic Imaging is the first SHAPE accredited Center of Excellence in San Diego. SHAPE is a scientifically validated and guideline based approach to Early Detection of Coronary Artery Disease. SHAPE (Society for Heart Attack Prevention and Eradication). SHAPE is comprised of the world’s leading preventive cardiologists. Cypress performs imaging at our Early Detection facility (located in Carlsbad), Physician offices, Assisted Living Facilities, Skilled Nursing Facilities, and Corporate Wellness Centers. We pride ourselves in the prompt reporting of results so physicians may proceed to the next course of action treating each patient. Our Early Detection Center, performs Cardiac, Vascular, and Early Detection Imaging in partnership with physicians to help facilitate a more preventative and proactive approach to healthcare. Early Detection leads to Preventative Medicine and may help facilitate changes with lifestyle modification, dietary changes, or drug therapy when indicated to manage risk factors that contribute to Cardiovascular Disease. Cypress Diagnostic Imaging utilizes state-of-the-art GE equipment and our studies are performed by highly trained, registered Cardiac and Vascular Sonographers. All studies are interpreted by Board Certified Cardiologists and studies are stored on our HIPAA compliant Studycast servers for 7 years. All cardiac and vascular studies are stored on our HIPAA compliant Studycast servers for 7 years. All Cypress Diagnostic Imaging cardiac and vascular studies are read by local, Board Certified Cardiologists. 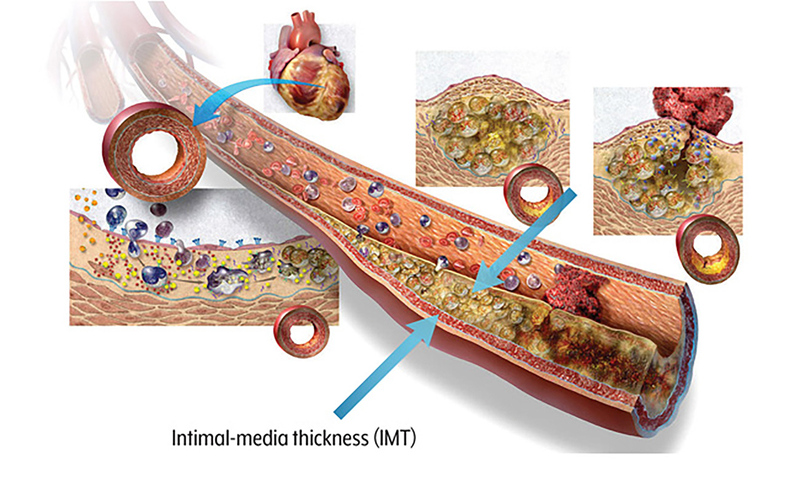 We are committed to the Early Detection of atherosclerosis, early stage coronary disease. Patients can work preventatively with their physician to reduce their risk of a heart attack or stroke. We utilize B mode ultrasound – non-invasive, pain free, and radiation free. Ultrasound is considered a safe for all patients, it can be used for a wide range of diagnostic purposes. We allow you to skip all of the redundant appointments for referrals and get you in right away! This gets you on a path to gaining information and being proactive in your health improvement! Cypress Diagnostic Imaging is the first Accredited SHAPE Center of Excellence in San Diego. SHAPE is comprised of the worlds’s leading preventive cardiologists and researchers. Get all the benefits for your preventive plan!